As dusk settled over Turkey on Friday evening, thousands of women assembled in fifteen provinces across the country in a series of synchronized sit-down protests; the latest show of national solidarity in the struggle for women’s right of autonomy over their own bodies. “My body, my choice,” is a slogan that has gone viral across Turkey over the past fortnight as the country’s baffled female populace find themselves suddenly obligated to fight for their right to abortion following the announcement of plans by the ruling Justice and Development party (AKP) to essentially outlaw the practice. At 8 p.m. on Friday, hundreds congregated outside the iron gates of the monumental Galatasaray Lycee on İstanbul’s İstiklal Avenue, the very same spot where the city’s feminist masses gathered for International Women’s Day on March 8, oblivious to the uphill battle they would find themselves fighting exactly three months later. “Abortion is a right, Uludere is a massacre,” read one banner. “We don’t want a male state,” declared another. “We are protesting – because abortion is not murder, banning abortion is. We are protesting because our bodies, our sexuality and our fertility are for no one else to meddle with. 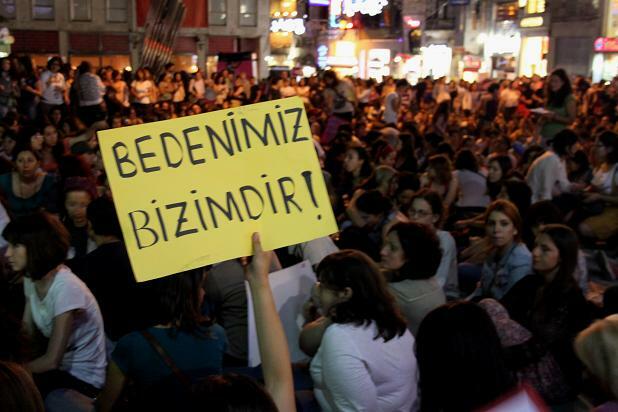 We are protesting because abortion is not murder, Uludere is,” announced activist Feride Eralp. A relative non-issue in Turkey in recent decades following the liberalisation of the practice in 1983, abortion was unexpectedly pushed to the forefront of the political agenda by Prime Minister Tayyip Erdoğan two weeks ago when he described the practice as “murder,” proceeding to apply baffling logic by comparing the procedure to the killing of 34 Kurdish civilians in Turkey’s Uludere province by military jets in December of last year. Following the announcement that a bill is currently being drafted to ban abortions after the 4th week of gestation – terminations are currently legal until the 10th week – abortion has become the latest example of Prime Minister Erdoğan pooh-poohing the fundamental principles of a participatory democracy. As was the case with the recent educational reform in Turkey, constituents yet again find themselves clamoring for public debate and demanding to be served in a more transparent way. However it has not only been the insensitivity of an equation of abortion with the death of 34 Kurdish villagers, nor the outdated and narrow-minded rhetoric that has dominated discussion on the issue, that has sparked outrage across Turkey, but also the question of the rationale behind pitching the ethics of abortion into the political agenda when so many grave women’s issues in Turkey continue to be inadequately addressed. Ranked as 126 out of 135 countries in the 2011 World Economic Forum’s Global Gender Gap Index, a report published by the parliamentary Human Rights Commission in early May indicated that figures for domestic violence and violence against women have doubled in the past four years in Turkey. According to Article 16.1.e of the Convention on the Elimination of All Forms of Discrimination against Women, women have the right to “decide freely and responsibly on the number and spacing of their children.” Erdoğan, who has advocated families having at least three children for years, seemingly forgets Turkey is a signatory status to this article all too often. Driven by a desire to see Turkey among the world’s top economies by 2023, the Turkish prime minister has attacked abortion and caesarean births as conspiracies designed to stall Turkey’s economic growth. A report released this week by a platform “The Right to Abortion Cannot be Banned,” made up of members of women’s rights groups from across Turkey, details that establishing the legal grounds for women to end unwanted pregnancies contributed to the decrease in maternal mortality, which dropped from 250 to 28 in every 100,000 live births from the 1970s to the mid-2000s. The report further discloses that there is no data indicating that abortion is on the rise in Turkey; on the contrary, while 18 pregnancies out of 100 ended in abortion in 1993, this ratio was down to 10 percent in 2008. The current governmental initiative to ban abortion, the article continues, is simply another manifestation of an ongoing misogynist mentality that ignores women’s right to make decisions on matters that concern their bodies. Indeed, this is certainly not the first occasion that women’s bodies have been politicised in Turkey. Despite promises to lift the draconian head scarf ban that has been inhibiting women’s access to education and professional vocations for decades in Turkey, Erdoğan, currently in his 9th term in office has as yet failed to do so. While the ban, a vestige of the Kemalist era, was relaxed by the higher board of education in 2010, women who chose to wear the headscarf are still constitutionally outlawed from working in the public sector. Setting debate over the ethics of abortion aside, as a country which has continued to disappoint with its unwillingness to implement strong enough measures to protect women’s rights effectively, Turkey is in no position to start constructing artificial conflicts let alone withdraw existing rights. As protests continue in earnest, activists have at any rate been able to take heart from sentiments of support from somewhat unlikely sources. On Thursday AKP party minister Nursuna Memecan spoke out against the proposed change in law saying that curbing abortion would only lead to unsafe abortions and increase maternal mortality and add unnecessary danger and difficulty to women’s lives. “Both abortion and caesarian sections are painful procedures for women. Such decisions are by no means made lightly,” she said. Feminist Hidayet Şefkatli Tuksal, a devout Muslim, told the Akşam daily newspaper on Wednesday that while personally not an advocate of abortion that banning the procedure is not Turkey’s answer. “The way to prevent abortion is to make birth control more readily accessible for women. However, family planning units have been abolished while women’s access to birth control methods has been made more difficult, in many ways these have paved way for abortion. Then you are trying to ban it. An abortion ban will only result in desperate women having to resort to other unhygienic and dangerous means to solve their problem,” she said. With over 50,000 signatures having been amassed on an online petition against the proposal over the past week alone, solidarity among Turkish women is high but only time will tell whether their state is ready to grant them the autonomy over their own bodies that was never anybody else’s to take away. Latifa Akay is a London-based freelance journalist and a postgraduate student at the School of African and Oriental Studies. She has previously been published by The Guardian, Today's Zaman and The Scotsman. Abortion is murder and we all sort for freedom if it is so there would have been no need for the laws. Thank you for an excellent and important piece. A well-written and insightful article with a clear message highlighting AKP’s ridiculous attempts to divert public attention. I hope we dont go American over this issue and can sustain a soulful, understanding and dialogical space over bodies, babies and life.